No one ever warned me that the most difficult thing to learn as a teacher was patience and self-control. I guess that until you are put to the test, you never realise that you need these attributes. I didn’t realise my potential for anger until I had children of my own. Fortunately I have a very wise partner who said once, and only once, ” Please don’t do that, you are setting them a bad example”. I have tried to have this in my head ever since – sometimes successfully and sometimes not. I have often said to my friends, that if I ever become a ‘cranky old intolerant bag’ who gets irritated easily and ‘loses it’ with students, that they have to love me enough to tell me that it is time for me to stop teaching. I do not want to be responsible for turning some poor student off learning just because I am tired and old. The funny thing is, that although being patient is something that we need to learn and practise, it is not just limited to one age group. Some people seem to be calm and patient by nature. Why are they? Have they had good role models in their life? Are they just ‘placid’ types? I have no research to back me up, but just from observation and experience, I think that patience is learnt and that it is learnt from others modelling this behaviour. Before I began teaching I worked for a very patient man. One day when I made a mistake, that cost him time and therefore money, all he said was, “Well, you won’t do that again.” I wasn’t fired, he never mentioned it again and yes, I learnt from my experience – I didn’t make THAT mistake again. Also, we choose to be patient when and with whom it suits us, which means that self-control is involved. I find that I can be very patient with tasks that I enjoy, with small children and with animals. I am still learning to be patient with teenagers and ageing relatives. I must remember that I was once a really ‘hard to get on with’ teenager and that I am probably already irritating people who are younger than myself. We can teach children to wait, but learning to wait is not learning to be patient. Learning to wait because we are being considerate and understanding of others is a completely different matter. I can make a child be compliant but it is not true compliance unless they are wanting to do what has been asked. This is where we as adults, parents or teachers have to try, in our busy schedules, to take the time to listen to them. Every time I have punished someone unjustly it is because I have leapt to the wrong conclusion. I have not been patient enough to hear the whole story from more than one point of view and to take the time to work out what was really happening. So, after these ramblings, what is my conclusion? Patience and self-control are very hard attributes to learn, especially if there are no great role models to learn from. 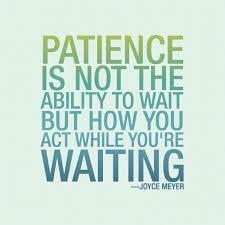 We, as teachers, need to model patience and self-control if we want our students to behave in a safe respectful manner. Our students will be more inclined to learn from us if we patiently take them through the stages of learning with patience and kindness. I am making 2014 the year for me to work on being more patient and having greater self-control. How about you?